Are you enjoying Sew Let’s Quilt Along? I sure am! It’s so much fun to see what everyone is making. If you’ve missed any of the blocks, you can find all of the links on my quilt along page. It’s time for block 4, and I couldn’t be more thrilled to share my designs! The theme for this block is thread. Where would we be without thread? I love the amazing variety that is available now, and I wanted to showcase that in my design. Rather than just using a traditional spool, I looked at four types of thread I use regularly - Aurifil, Masterpiece, King Tut, and OMNI. I started by designing Thread Tales, which has everything lined up neatly on shelves. Then my friend wondered what would happen if I did something more scattered, and Spinning Spools was born. In the end, I couldn’t choose just one, so I’m sharing both patterns this week! Even though there are two patterns, you only need to make one of them to be eligible for prizes. Just choose the version that suits your taste. It was amazing to see everyone’s tenacity in tackling the ruler block last week! The perseverance and encouragement of our group made me so happy to be hosting this quilt along. And if you’re feeling a bit overwhelmed after that block, I want you to know that this one will be easier. While this block has a lot of pieces, and some of them are very small, it doesn’t require the same level of precision as the ruler. And I have a slew of tips in this post to help you succeed. All block patterns for Sew Let’s Quilt Along are guaranteed to be free until the quilt along ends on September 24, 2019. Click the button below the block you would like to make in order to download the pattern. It’s a huge help to label your pieces as you cut. I like to use these stickers. I also keep my pieces organized on a baking sheet. It makes it easy to move around my sewing room without losing anything. Here you can see that I grouped the pieces by which type of spool or cone they were part of. As I got closer to the end, my design boards really came in handy. They’re foam core covered with batting so that fabric sticks to them. I used them to lay out my pieces so I could be sure I kept them in order. If you would like to make some design boards of your own, check out my tips here. Any time a block has different sized pieces coming together, it’s essential to test your seam allowance. It’s the only way you can be sure everything will fit together nicely and your block will come out at just the right size. To test your seam allowance, cut two 2" squares and sew them together. Press as desired, and measure the resulting rectangle. The rectangle should be 3 1/2" long. If your rectangle is shorter, you need a narrower seam allowance. If your rectangle is longer, you need a wider seam allowance. Adjust your seam and try again. Once the rectangle is exactly 3 1/2" long, you're good to go. Chain piecing really speeds things up. If you’re not feeling confident, try making one of each item, then chain piece the rest. My favorite tool for drawing the diagonal lines is a Sewline ceramic pencil. They come in several colors, but I just bought one pencil and change out the lead as needed. The secret to making a successful stitch and flip corner is to stitch just outside of the drawn line. The line you drew isn't the stitching line - it's actually where the fabric needs to fold! By stitching just outside of the line, you give yourself the extra fabric you need to reach all the way to the corner when you flip it over. Just to be safe, I always test to make sure my corner is covered before I cut away the excess fabric from the back. A lot of the seams in these blocks are pretty short, so I skipped the pins. But it’s a really good idea to use them when you get to the long seams. It’s so easy for the fabric to shift on those longer seams, so the pins make a big difference in the final block. It’s easy things to get wonky, especially when you’re working with small pieces. To help prevent that, I starched my fabrics with Best Press before cutting. It adds a little bit of stiffness to the fabric to help keep it from stretching. You still need to be gentle, but the Best Press makes a big difference. Accurate piecing is about so much more than the seam allowance - the way you cut really matters! Take the time to line up your ruler the same way on every piece of fabric. I prefer to have the line of the ruler completely on my fabric. It’s a lot easier than trying the eyeball the middle of the line, and it often provides the few extra threads that are needed for our pieces to come out right when using a 1/4” foot. What really matters is that you’re consistent. Line up the ruler the same way every time, and only use one brand of ruler. The lines are a little different on every ruler, and that makes a bit of difference in the size you’re cutting. Some of the pieces in this block are only 3/4" square. To keep those short seams from pulling apart, I recommend using a pretty short stitch length. I set the stitch length on my Viking to 2.0, which is about 16 stitches per inch. I thought it would be helpful to include a photo tutorial for making the tall cones (the ones with the angled sides). You’ll have to check the pattern for the measurements, but this will show you how they should look as they’re coming together. First, make a mark a little bit in from each corner (the exact measurement is in the pattern). I used my Sewline Ceramic Pencil for this. Next, cut from the bottom corners to the marks you just made. Line up the background pieces with the cut center thread piece. You want the background to extend past each end fairly evenly (you can eyeball this). Lay the background right sides together along the angled sides of the thread and sew. Important - Make sure the thread is centered before you trim. Be extra careful that you leave a 1/4” seam allowance for both bottom corners. The top corners of the thread should be at 3/4” and 2 3/4”. The bottom corners of the thread should be at 1/4” and 3 1/4”. Trim two sides, then rotate and trim the other sides. The size you should trim to is in the pattern. This is what the unit will look like after trimming. And here’s a finished cone with the spindle added! We have nine hosts for segment one, and we all made our very own thread blocks. Be sure to visit all of the lovely ladies below for more tips and inspiration. If you like what you see, leave a comment! We all love a bit of encouragement from our fellow quilters. Bobbi Bridgeman @ Snowy Days Quilting <— That’s me! 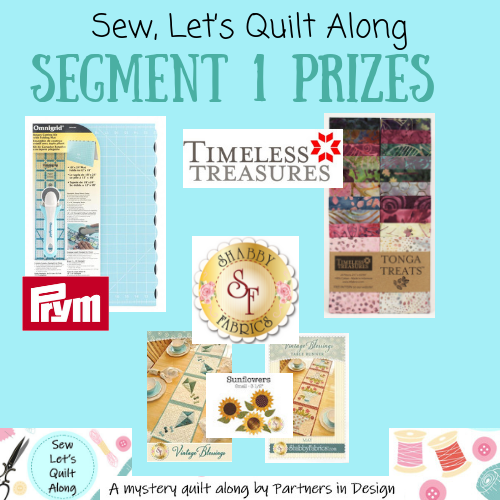 We will have a prize package at the end of every segment, as well as a grand prize at the end of the quilt along. The prizes are open to all participants that are at least 18 years old. If you don’t remember what I mean by segment, check out the intro post for a refresher on how this quilt along is structured. To be eligible to win a segment prize, you need to make all of the blocks from that segment. Share a photo or photos of your blocks (in a single post) to be entered. To be eligible to win the grand prize, you need to make all 13 blocks from the whole quilt along and turn them into a quilt or other project(s). Quilt tops don’t need to be quilted, but projects do need to be finished. Share a single post that shows all of the blocks in a quilt or project. It doesn’t matter how many projects or what projects you make, or how many blocks you use in each project as long as you show that you’ve used all 13 blocks in a finished project or projects. To keep the contest portion of the quilt-along fair and fun for everyone, only quilters that use all of the designers' blocks [in a quilt or project(s)] will be eligible for the grand prize. Likewise, our segment prizes will only be open to those that make all of the designers’ blocks for that segment. 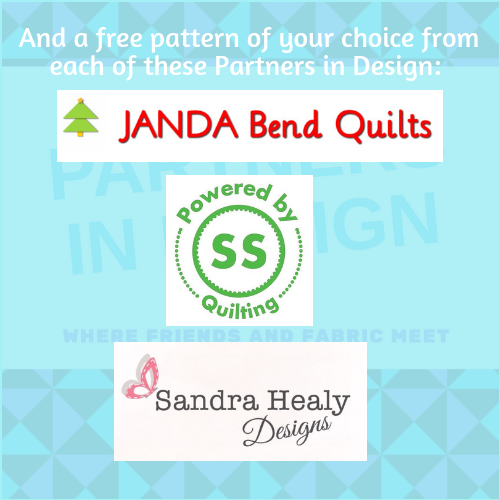 We are really lucky to have some amazing sponsors on board for this quilt along! Please check them out as thanks for supporting us. Bluprint, Dear Stella, Everything Mary, Island Batik, Paintbrush Studio Fabrics, Prym, Shabby Fabrics, Timeless Treasures, Warm Company Additionally, many of the block designers are donating their quilt patterns. I hope you’re excited about this week’s block! Which one do you think you’re going to make? I can’t wait to see it! Posted on April 22, 2019 by Bobbi Bridgeman and filed under Quilting, Quilt Alongs and tagged Sew Let's Quilt Along Partners in Design pieced quilt block mystery quilt. I can’t believe we’re already on block 3 of Sew Let’s Quilt Along! If you’re just joining us, you can find all the information and links to past blocks on my quilt along page. 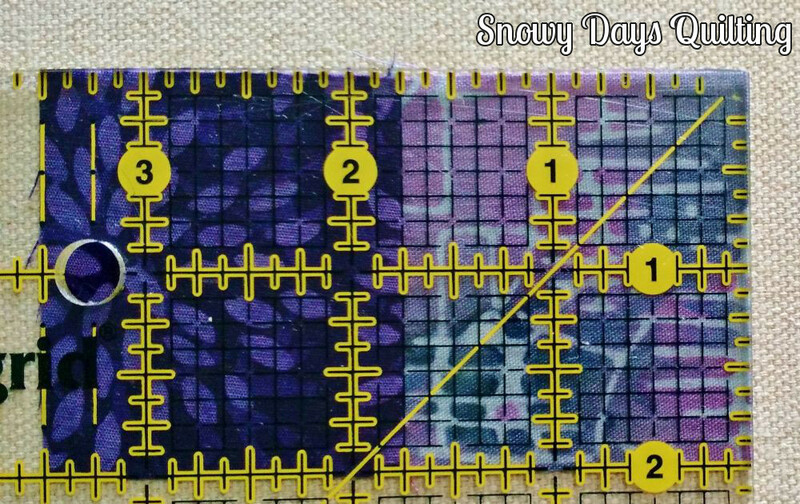 This week’s block is designed by Sherry Shish at Powered by Quilting. It’s the corner of a rotary cutting ruler! I’m so glad I learned to quilt after the invention of the rotary cutter. I just can’t imagine having to cut everything with scissors! Head on over to Sherry’s post to get the pattern. All of our block patterns will be free until the quilt along ends on September 24, 2019. This block has some very small pieces, and they all need to line up just right for it to look like a ruler when it’s finished. Fortunately, there are some things you can do that will help your block come together well. My biggest tip is take your time. Cutting carefully, sewing slowly, and handling your pieces gently will make a big difference. It took me about 5 hours to cut and piece this block (not counting the applique). Seam Test - Extra Important! But it’s even more important this time! For this block, you’ll want to press all of your seams open. If you’re like me, almost never do that (trust me - it really is necessary this time). Pressing your seams open means you lose a little bit less fabric going up and over the thread. Your seam allowance will need to be adjusted to account for this. To test your seam allowance, cut two 2" squares and sew them together. Press open for this block, and measure the resulting rectangle. The rectangle should be 3 1/2" long. If your rectangle is shorter, you need a narrower seam allowance. If your rectangle is longer, you need a wider seam allowance. Adjust your seam and try again. Once the rectangle is exactly 3 1/2" long, you're good to go. Sewing narrow strips into sets, then cutting those strip sets into more narrow strips makes it easy for things to get wonky. To help keep that from happening, I heavily starched my fabrics with Best Press before cutting. I actually repeated the starching process several times to make my fabric pretty stiff. The Best Press will come right out when I wash the quilt, so I don’t mind being heavy handed with it. Many of the pieces in this block are only 1" wide. To keep those short seams from pulling apart, I recommend using a pretty short stitch length. I set the stitch length on my Viking to 2.0, which is about 16 stitches per inch. In hindsight, I maybe should have gone even a bit smaller, because I found that pressing the seams open made them more inclined to pull apart. I love my design boards! They’re foam core covered with batting so that fabric sticks to them. I used them to lay out my pieces so I could be sure I didn’t sew any of the strips together in the wrong order. If you would like to make some design boards of your own, check out my tips here. For this block to look like a ruler, it’s important for the seams to line up. That means it’s really worth it to take the time to pin everywhere there’s a seam coming together. I carefully pinned right in the join between the fabrics so I could be sure they were lined up perfectly when I went to the sewing machine. Once you’ve finished piecing your block, you’re in the home stretch! You just need to add the numbers so it really looks like a ruler. Sherry has helpfully provided a test square so you can be sure your pattern printed at the right scale. Measure this box to be sure it’s 1” square before you trace the numbers. I really like to trace applique with a pencil. That way I can erase any lines that aren’t quite right. Note that you need to trace each number twice so you can use them on both sides of the ruler. My preferred fusible web is Lite Steam-A-Seam 2. Make sure you don’t put your 3’s too close to the edge. You don’t want them to get caught in the seam allowance when you sew your block to something else! To make sure I was clear of the seam allowance, I covered it with one of my rotary rulers before placing the number. Once you’ve fused your numbers in place, it’s time to stitch around them. I prefer to use a straight stitch just inside the edge of each piece. For this block, you’ll want to stitch extra slowly. If your machine has a needle down function, go ahead and turn it on. The curves inside the numbers are especially tight, so it helps to stop with the needle down and lift your presser foot so you can pivot the block before taking the next stitch. I always prefer to use matching thread for applique. It keeps the stitching from standing out too much, and it makes any mistakes less noticeable. For this block, I used Aurifil 1148 Light Jade. We have nine hosts for segment one, and we all made our very own rulers. Be sure to visit all of the lovely ladies below for more tips and inspiration. If you like what you see, leave a comment! We all love a bit of encouragement from our fellow quilters. I hope you’re excited about this week’s block. I love that it’s a tool we use every day. I can’t wait to see what colors everyone chooses! Posted on April 8, 2019 by Bobbi Bridgeman and filed under Quilting, Quilt Alongs and tagged Partners in Design Sew Let's Quilt Along mystery quilt pieced quilt block applique. Welcome back to Sew Let’s Quilt Along! It’s a fun, free, sewing-themed mystery quilt along. If you’re just joining in, my quilt along page has links to all of the information and past blocks. We’re glad to have you! Our second block is this fun quilter’s mug designed by April Adams of JANDA Bend Quilts. Her idea of printing on fabric with an inkjet printer opens up a whole world of possibilities. If you don’t have a printer, you can embroider your block, or use a fabric pen like me (I explain my process below). I’m sure your mug will be amazing no matter which method you use! Head on over to April’s post to get the pattern. All of our block patterns will be free until the quilt along ends on September 24, 2019. I started by choosing the fabric for the center of my mug. I knew I wanted it to be light so the text would show up, but I still wanted it to have some interest. This paisley from my stash is one of my favorites, and it seemed to fit the bill perfectly. In hindsight, I probably should have chosen something even lighter, but I’m pretty happy with how this worked out. Since the center of my mug was purple, I wanted to continue that to the outside. This cherry fabric was just the right color. For the table, I wanted a dark blue that would contrast nicely with the mug. I just love April’s idea of printing directly on your fabric. Unfortunately, that method requires an inkjet printer, and I don’t have a printer! She also provides the option of embroidering the text, but I’m not a big fan of embroidery. So I got creative. My very favorite fabric pen is the Pentel Gel Roller for Fabric. It’s a permanent black ballpoint pen. I’ve been using it on my labels for years because it writes like a dream. I decided it would be the perfect way to get the words on my mug. I used a light layer of Best Press on the fabric to keep it from stretching as I worked, and I cut the fabric a bit big so I could perfectly center the text after I finished writing. Then I taped the fabric to the text page of the pattern so I didn’t have to worry about it shifting around. I don’t have a lightbox, so I taped the paper to a window. I traced the letters with my fabric pen, being careful to fill them in completely. Once I was done tracing, I carefully removed the fabric from the paper. I centered the text and trimmed the fabric to size. I found that I had about 3/4” clearance on the sides of the text, and 1” on the top and bottom. I’m really pleased with how it came out! The pen was easy to write with, the words show up well, and I know they will be permanent. The secret to making a successful stitch and flip corner is to stitch just outside of the drawn line. The line you drew isn't the stitching line - it's actually where the fabric needs to fold! By stitching just outside of the line, you give yourself the extra fabric you need to reach all the way to the corner when you flip it over. Just to be safe, I always test to make sure my corner is covered before I cut away the excess fabric from the back. As soon as I had everything cut, I laid out all of the pieces on a design board. It’s a foam board covered with batting so the fabric stays in place. The design board made it really easy to keep track of my pieces as I worked. If you would like to make a design board of your own, this post has all the information you need. April has great pressing directions in her pattern. But I know it’s sometimes easier to look at a picture rather than reading each instruction as you go. Here’s a diagram that shows how I pressed my seams. And here’s a peak at the back of my block. We have nine hosts for segment one, and we all made our very own quilter’s mug blocks. Be sure to visit all of the lovely ladies below for more tips and inspiration. If you like what you see, leave a comment! We all love a bit of encouragement from our fellow quilters. I hope you’re excited about this week’s block! I certainly can’t wait to see everyone’s mugs. Do you think you’ll go with the saying that April provided in her pattern, or do you have another idea for what you would like your mug to say? Maybe you want to feature a novelty fabric instead of using a saying at all. I would love to hear your plan in the comments. Posted on March 25, 2019 by Bobbi Bridgeman and filed under Quilting, Quilt Alongs and tagged Sew Let's Quilt Along Partners in Design mystery quilt pieced quilt block text in quilts.